Extremely scarce nautical chart of Singapore and Malacca - the most desirable of Horsburgh's influential nautical charts. To the Honourable The Court of Directors of the United East India Company This Chart of Malacca Strait Singapore Strait and the Southernmost Promontory of Asia Is Inscribed by Their Faithful and Obedient Servant James Horsburgh. 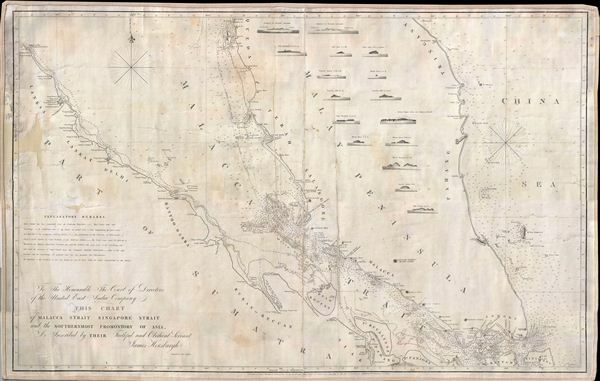 An extremely scarce 1844 James Horsburgh nautical chart of southern Malaysia, Singapore, and the straits of Malacca and Singapore. Good. Map has been professionally restored and backed with fresh linen. Some edge soiling and creases, especially at center and in the upper left margin. Fill repair on upper left margin. A couple of pencil marks indicative of use as a nautical chart.